Laptop Backpacks – An important accessory! So, what is the reason for this sudden rise in popularity for these backpacks? Obviously, after a point of time, people started feeling the heat of carrying a laptop bag, which at most will have leather strap-on. First, it is too heavy on a certain part of your body. Assuming you are a right hander, you would prefer carrying the bag resting on your right shoulder. Now, you can just not hope for your shoulder bones to take the brunt of the bag, and more importantly, the laptop for time eternal. God bless you, if your laptop is one of the heavier ones. With those pieces, you would surely give your shoulder bones a bad working, something you could do without. With the inception of backpacks, people have started smiling again. Not that everyone had a problem carrying bags, but the fact that backpacks made it so easy for everyone to carry laptops that this just seemed to be an excellent alternative. Of course, the brunt will now have to borne by your spinal cord instead of your shoulders. But considering that the spine and the back region is well-equipped to carry this much weight, this one seems to be a healthier option for sure. 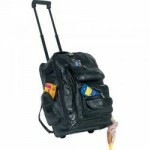 Laptop Backpacks work on the simple logic of good weight distribution of an item. It is simple logic that if the weight of a heavy item is distributed across a bigger area, the item would feel less heavy. With these backpacks, it is fair in saying that you may not feel like carrying a laptop, though you might still be carrying one. Though, not recommended, but since this is a backpack, you could stuff it with almost anything you would want. This is a flexibility that you could not have exercised with a laptop bag. Obviously, your bag with all the stuff will start looking like a warehouse, for which you do not want to be ridiculed in the open. Security remains another interesting aspect about these backpacks. It can be easy for anyone to clip off the leather strings, and run away with your laptop case. Scary thought, but these things do happen.. No such problem with the backpacks, as they remain close to your backs at all times. Bottom-line, laptop backpacks surely sound like an exciting and a user-friendly alternative for people to carry their laptops. Feeling the need of people, who are increasingly drawn towards using backpacks, a lot of laptop manufacturers are giving it a try with these backpacks. By now, all of them seem to have a smile on their faces! You can find high quality back Laptop Backpack Here at Discount Prices.